If you are looking for information on the The Back Rubber franchise business opportunity, The Back Rubber franchises or The Back Rubber franchising, then you have come to the right place. The Back Rubber offers one of the easiest vending opportunities for just about anyone. In fact, most of our customers have never had vending or business experience before starting their vending massage chair route. The opportunity is successfully being used in shopping malls, beauty salons, nail boutiques, casinos, country clubs, health and fitness centers, car washes, airports, hotels, hospitals, etc. 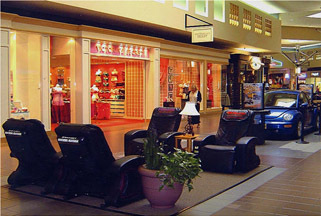 These wonderful vending massage chairs effortlessly make money in any high traffic area. and the money comes in immediately? You bet it would! We know the greatest fear people have in starting a vending business is getting locations. Many people do not want to make "sales presentations" or make face-to-face contact with location owners. If you don't want to try to place your chairs then why go through the "Trial and Error" method. Trial and error can cost you time, money and a lot of frustration. As a special service for our VIP Members, we can arrange to have a locator place your massage chairs in some of the best locations right in your own backyard so you don't have to! Start off as small as you desire, and expand your business at your own pace. Work full-time or part-time. Your income starts as soon as your bill operated massage chairs are on location, and your profit is only limited by the number of machines you want to own.